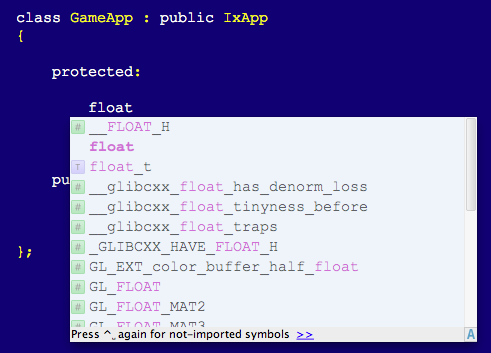 After I type "float" a list box appears with code completion suggestions. As soon as I press the tab key, it selects the first suggested thing (which winds up never being "float", it's like "__FLOAT_H") which is pretty annoying. So I always have to hit ESC before hitting tab. And both settings checked under the "Parameter info" section. it is most likely that the issue is caused by statistic and a related issue (OC-5945). Can you please attach the screenshot of the completion list? Also, try reproducing the problem on your code base with a clean settings (move ~/Library/Preferences/appCode20 to a safe place before experimenting and put it back when you are done) - does it recur? Attached is the screenshot showing the autocomplete list. When I use clean settings, the regular "float" is listed first. completion with TAB is a standard 'always-on' behaviour. Providing that the original problem with _FLOAT macro is s statistical issue, do you still want to diable TAB in completion? If yes, why? BTW, to clear only the completion statistic, remove ~/Library/Caches/AppCode20/stats folder; this should be enough to reset all completion lists to the default state. If nuking the stats folder will solve the problem then I suppose it's a moot point. My desire to disable tab completion was to get around any code completion bugs. I'll give it a go tomorrow and see if it works. Thanks! So I just deleted that stats folder....and it doesn't fix the problem. I'm still getting the wrong float completion along with int and a few others as well. Anything else I should try to reset? I'd be loathe to nuke my entire settings file and have to reconfigure everything from the start. For a low cost test, you can always move/rename the current settings directory to test something, and then move it back later to restore your settings. Just do the moves with AppCode shut down. OK so I tried disabling the option "Sort lookup items lexicographically" and that seems to fix the issue.